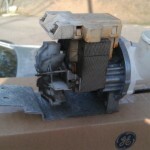 The following is a set of pictures from a recent Samsung Front-Loading Washing Machine Repair. The rubber gasket/boot that seals the front door of the washer needed to be replaced. We ordered the correct part and completed this Washer Gasket Repair in no time at all. A Samsung Washer with a Front Door Gasket that needed replacing. 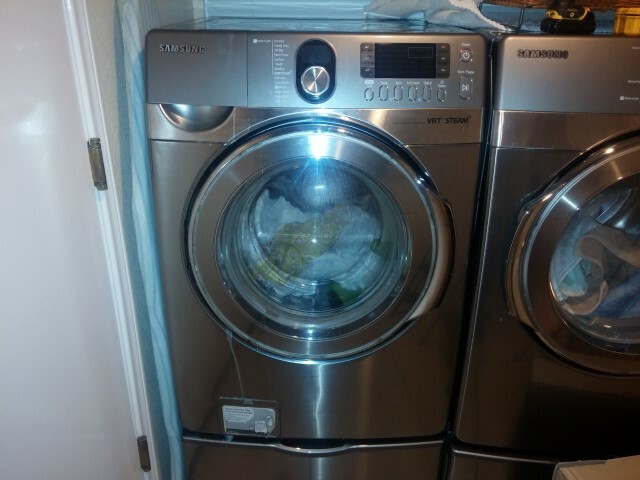 Call on us for low cost San Diego appliance repair services. We charge a small service fee of $30 to diagnose your appliance and determine what parts need to be replaced. The service fee is waived (free) when you have your appliance repair done by us. You will only pay for the parts and labor of your appliance repair. We repair major home appliances by Samsung, GE, LG, Whirlpool, Kenmore, and many more appliance manufactures. Give us a call at 619-327-9501 for more information or to schedule an appointment. You can also schedule an appointment online. Our latest appliance repair video features photos from a few of our recent Whirlpool Dryer, Whirlpool Washer, Whirlpool Microwave, and Whirlpool Refrigerator repairs. These Whirlpool repairs were in La Mesa, El Cajon, Santee, and San Diego. We repair all Whirlpool appliances and we also repair many other appliance brands. We have the best rates in town for appliance repair in Santee. We repair washing machines for the lowest cost in town also. We repair clothes dryers and refrigerators for the best price you have ever seen. We offer our same great appliance repair service in El Cajon as do everywhere else. This announcement serves as a reintroduction of our great and affordable appliance repair services in El Cajon. Our expert technicians will quickly and accurately diagnose your appliance problems. We are then prepared to give you the best deal in town for the repair of your appliance. Please visit our services page for more information on all of our affordable appliance repair services. We work on all appliance types from all major appliance manufacturers. We repair it all in El Cajon! Call our appliance repair hotline at 619-327-9501 to set an appointment or for just more information. Our service call fee of $30 is waived and you’ll only pay for parts and labor if you choose to have the repairs done by us within 30 days of your quote. For the best prices in El Cajon for appliance repair, give us a call at 619-327-9501. You’ll be glad you did.